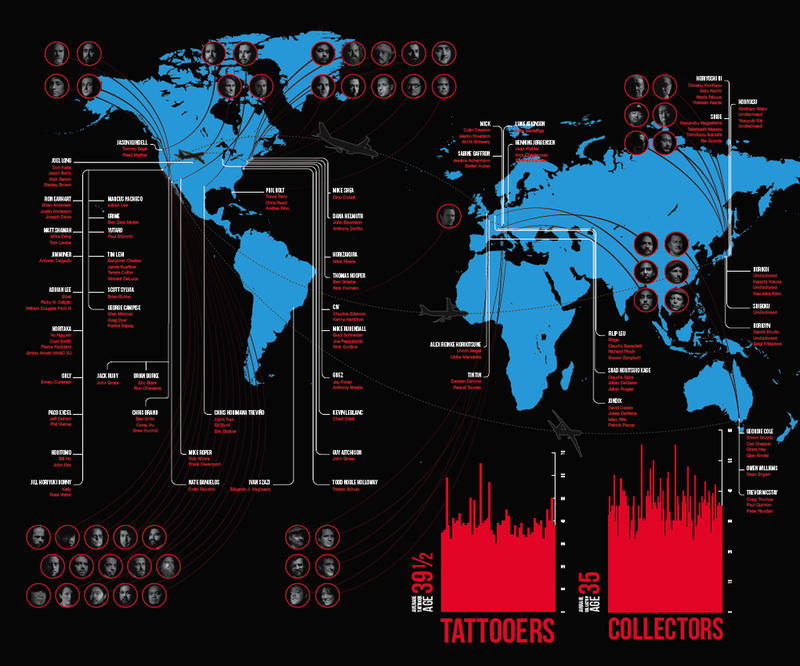 After several years traversing the globe, the compilation of this comprehensive collection of contemporary tattoos by some of Earth's most passionate and dedicated tattooers is complete. BloodWork: Bodies is an archival body of work requiring time and attention to absorb. Weighing in at 27lbs, the scale alone informs the holder of the commitment needed. Inside this tremendous 900 page tome, 119 backpieces and bodysuits created by 53 tattooers the world over are documented in luxuriant detail. The oversized foldouts offer massive views of each tattoo, exhaustive close-up studies reveal hidden details, and portraits of tattooers as well as collectors personalize each image set. The two-volume collection, overwhelmingly large as it is, has been carefully crafted using heavy art paper, cloth binding, debossed foil and blind stamping, subtle matte and gloss treatments, fifth color spot, and a sturdy slipcase. Its design and construction are to be enjoyed today but will be of most value to the generations to come. Additionally, the accompanying ether based 360' rotation libraries open a door previously locked. Now, with the ability to rotate and zoom each collector on a single 360? axis, the tattoos unfold to the viewer as they would if observed in person. Each copy of BloodWork: Bodies comes with codes that will grant the owner access to the extensive web-based 360' galleries. Once logged in, the holder has unrestricted access to the entire reference archive. While the two-volume set of exquisite photos and accompanying web-based 360' libraries make for an invaluable reference tool, the deeper raison d'etre behind BloodWork: Bodies is as a vessel to generously preserve the works of contemporary tattooers for future generations. Of equal importance, it presents the tattoos in the light their beauty commands. As a whole it is a sublime representation of the illuminated man. Limited edition of 1200 acquirable numbered copies. Participating Tattooers: Adrian Lee, Alex Reinke Horikitsune, Bryan Burk, Chris Brand, Chris Trevino, Civ, Dana Helmuth, Filip Leu, Geordie Cole, George Campise, Grez, Grime, Guy Aitchison, Horigyn, Henning J?rgensen, Jack Rudy, Jason Kundell, Jill Horiyuki Bonny, Jim Miner, Joel Long, Jondix, Kevin LeBlanc, Horikoi, Luke Atkinson, Marcus Pacheco, Matt Shamah, Mick Mike Roper, Mike Rubendall, Mike Shea, Nate Banuelos, Orly, Owen Williams, Paco Excel, Phil Holt Ron Earhart, Sabine Gaffron, Scott Sylvia, Shad Horitsuki Kage, Shige, Shuboku, Horitaka, Thomas Hooper, Tim Lehi, Tin-Tin, Todd Noble Holloway, Horitomo, Trevor McStay, Ivan Szazi, Horiyasu, Horiyoshi III, Yutaro Sakai, Horizakura.